Unfortunately I have been rather quiet as of late. I have had a few things going on which has kept me busy. I have finally found some time to put this brief piece together. 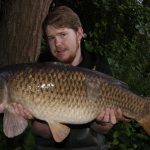 Back in June, I started my campaign on a syndicate just up the road from me which I have been lucky enough to have been offered a ticket. There are two lakes on the small Bedfordshire complex, one being slightly easier than the other. I have started on the slightly easier one of the two to try and find my feet and get a couple of bites. Two nights into my campaign and I had nothing to show, having said that I wasn’t too despondent as I can’t expect to catch from the off. 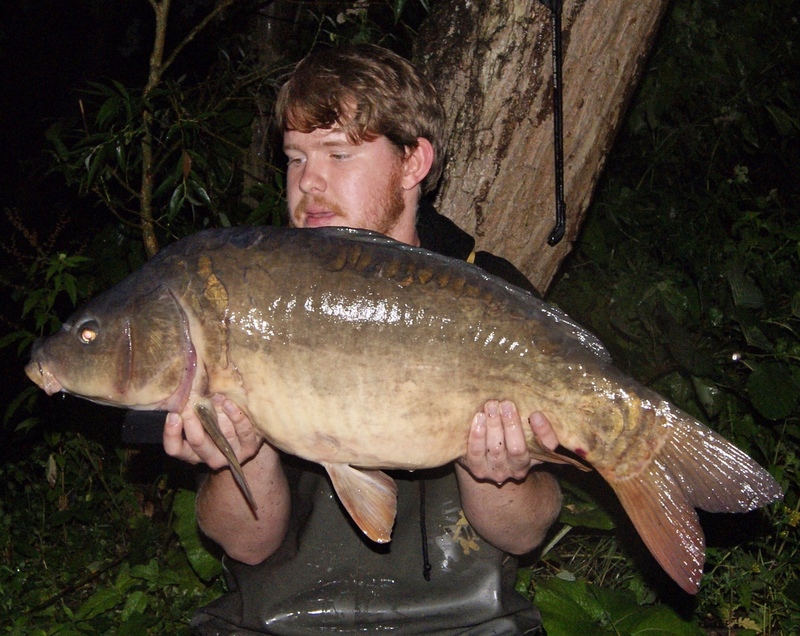 For a short while I had pre-baited a small reed line with a couple of kilo of Manilla every couple of sessions. I then embarked on my first quick overnighter which I have fallen in love with thus far and managed to fish the spots I had been baiting. 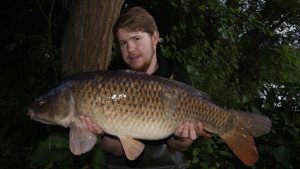 First session in saw me bagging two fish an awesome proportioned 19lb Common and a 17lb Ghostie. I managed to bag both these fish before setting off for work that morning. Albeit I made it to work late after losing my car keys but we won’t go there ha-ha. After a lot of deliberation and well before this overnighter, I decided to really strip back my rigs and go basic again. I had one of the mind bending type thoughts about what’s going on with my rigs etc. So, I went back to a simple KD rig and Manilla wafter and just a straight hair rigged bottom bait. How simple could it get? 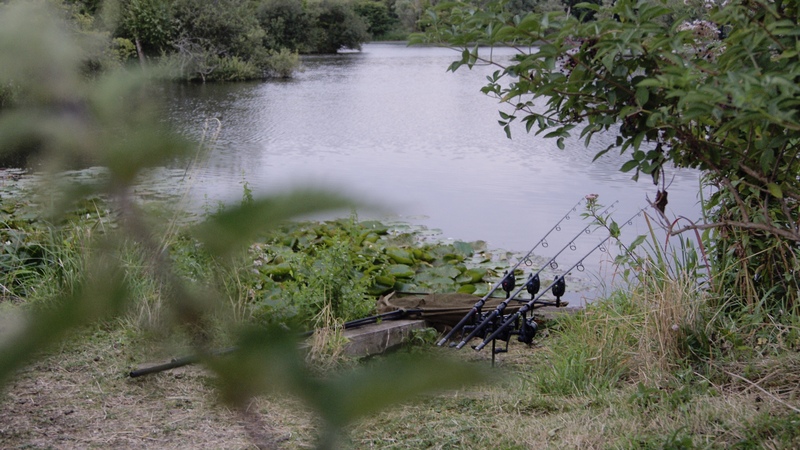 I then embarked on my next overnighter, again in the same swim but I managed to lose a fish off the prebaited spot. This knocked my confidence down a peg and I was a little distraught. I didn’t let this defeat me. I skipped the rig back out to the spot and it was rocking again. This rod fortunately did a last minute bite before heading into work. The particular swim is a bit of a mission really. There is a small bay which goes behind the swim I have been fishing, once you hook a fish they kite up into the bay, the only way to retrieve them is to put on the waders and go after them which I have had to have done the last couple of bites I have had. 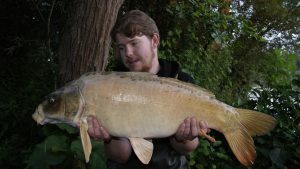 After this small spell of action and mulling it over with the lads at work, I got back down for a short day session and capitalised on a feeding spell of a couple of hours. I managed a further two bites from this spot. I had finally rinsed the rest of the bait in the bucket and set off home. The following week I was back down again and into the same swim. I didn’t want to get into this habit but I felt there were more bites to be had. The first bite came pretty early and saw me landing an awesome 22lb mirror. The shots were delayed a little as we had an immense downpour. I say it out under the brolly until a break in the rain came and she was soon slipped back after slapping the self take remote out of my mouth. 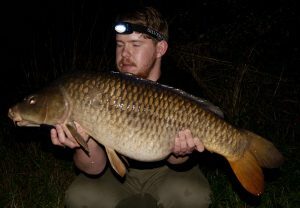 I then followed her up with another two 13lb commons on the simple KD rig with a Manilla wafter on a helicopter set up. I went with a helicopter set up as it meant that I could more or less cast anywhere and be well presented. 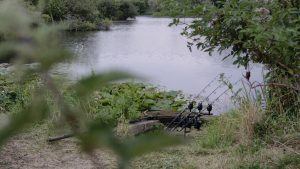 After a two week break and a weekends filming at the prestigious farriers lakes in the Cotswolds, I was finally buzzing and ready for business once again. I got to the lake after work and there wasn’t another angler in sight, only on the opposite lake. I walked round to a swim that I had in mind and consequently saw a couple of fish, so what better swim to go into. There was a nice south westerly pushing across the lake and much to my surprise we were due a full moon. I haven’t fished on a full moon for a good couple of years and I can assure you it wasn’t at all planned. After having a brief lead around, I found some nice clear gravelly areas which were bound to throw up a fish or two. Two KD rigs, one on a small gravel patch to my left and one on a short strip of gravel to my right which was partnered with a hinged rig. 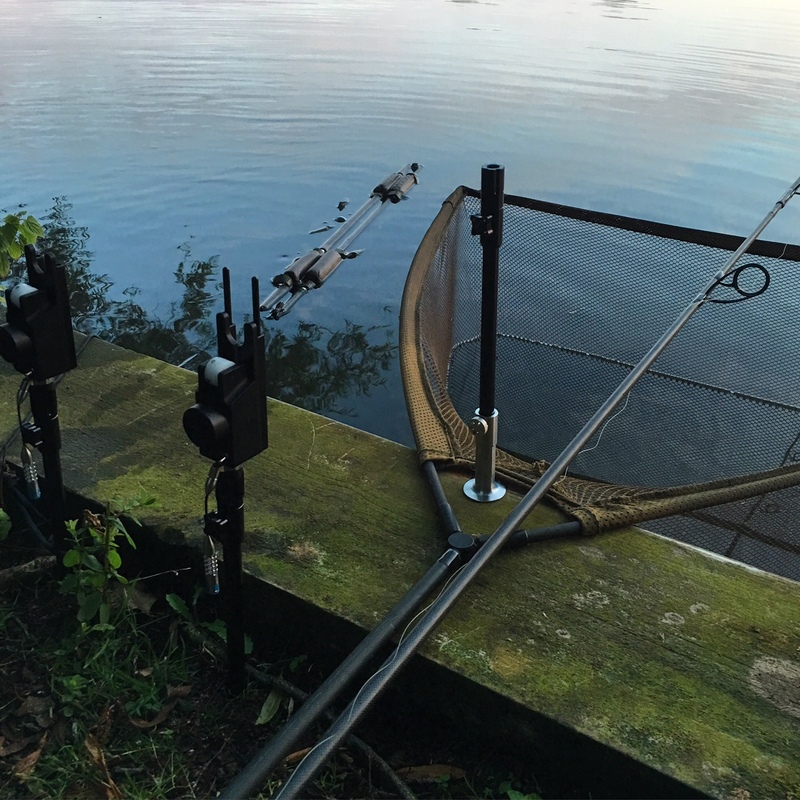 The hinged rig was set up with a white Manilla Popup over 20 spombs of bait. 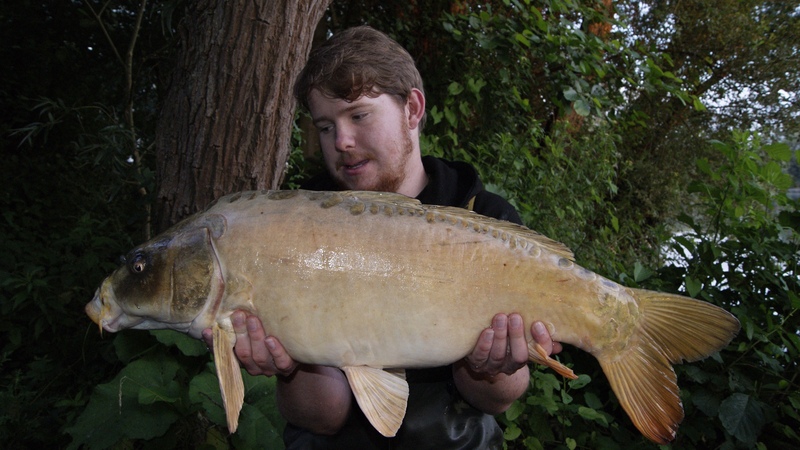 I wasn’t going to hold back on the bait as I had the lake to myself and the fish were incredibly active. 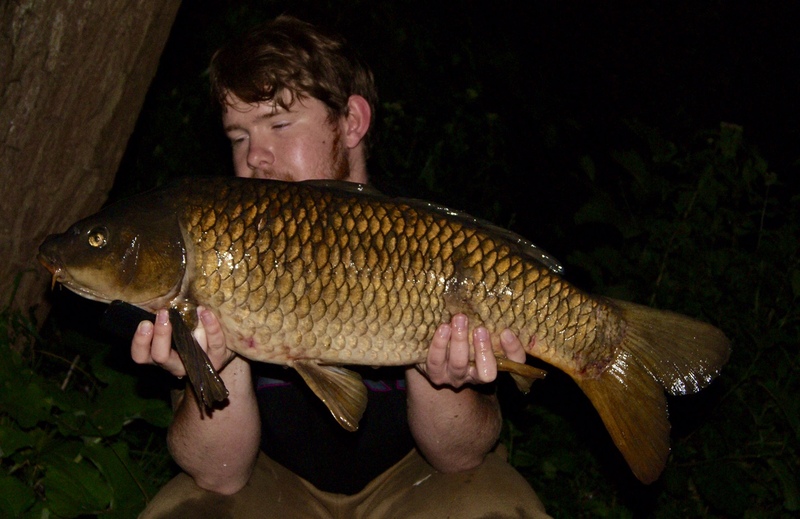 2:30am soon came around and I soon had an awesomely proportioned 20lb 3oz common sulking in the bottom of the net. She was soon photographed and slipped back. Then much to my surprise, with the lake lit up by the awesome full moon, the hinged rig was away and I was attached to a spritely 18lb 6oz common which was an odd shape but was an awesome fish all the same. I didn’t recast as it was getting on and I wanted to get a couple of hours sleep before going to work. Before packing down, I put the rest of what bait I had left out on the gravel strip in hope they would revisit that area. I am happy with my progress thus far, I am going to keep going with the overnighters and go through the winter as I did last year to really maximise the short time that I do get. That is a very brief run down of my time so far and I hope to get amongst a few more. Be lucky in your fishing.